Rose Mullan was the centre of her family and when she was diagnosed with Dementia, they repaid the dedication and love she had shown to them by caring for her in her final years. And since the popular former nurse passed away at the age of 85 in March 2016, the family have decided to fundraise in her memory to help others affected by Dementia. Over the past three months, the Mullan family have raised over £1,700 through a fundraising drive in aid of the Alzheimer’s Society which included a hike up Mount Errigal recently. In her latter years, Rose had taken up painting and among the Donegal beauty spots she portrayed, was Mount Errigal, beside the Donegal village of Glenswilly where she was born. Rose was the oldest of 13 children born in Glenswilly to local blacksmith, Charlie Bonner and his wife Frances, and she grew up on a small farm. After leaving Technical College, she began her training as a nurse in St Conall’s Hospital Letterkenny, where she met her future husband Jim Mullan, a Derry man who was working in James Doherty Butchers’ Shop on Main Street. The couple had seven children, Gerry, Cathal, Adrian, Noeleen, Francess, Gary, Edwin and lived firstly in Creggan before moving to Brookdale Park in Galliagh but, tragically, Jim died suddenly at the age of 59, leaving Rose a widow at 56. She continued to work as a nurse in Derry until she eventually retired from Stradreagh Hospital. It was then, after joining U3A (University of the Third Age) that she took up Tai Chi and also painting. The group pictured at the start of the climb up Mount Errigal. Her family said she surprised everyone with this hidden artistic talent and Rose left many beautiful paintings as her legacy to be enjoyed by her family. 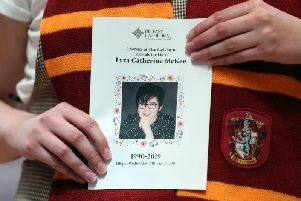 Her relatives said Rose’s “laughter and sense of fun was shared by all who knew her and her kindness is remembered and cherished” and that Rose was “always a familiar face at the bingo hall, the chapel and the local shops”. And following their successful three-month fundraising campaign this year, the family now plan to stage a fundraising event in Rose’s memory every year. Since Rose passed away, her children and grandchildren have honoured her memory in another way be ensuring they continue the tradition of gathering together as a family for special occasions. The late Rose Mullan's stunning painting of Mount Errigal.